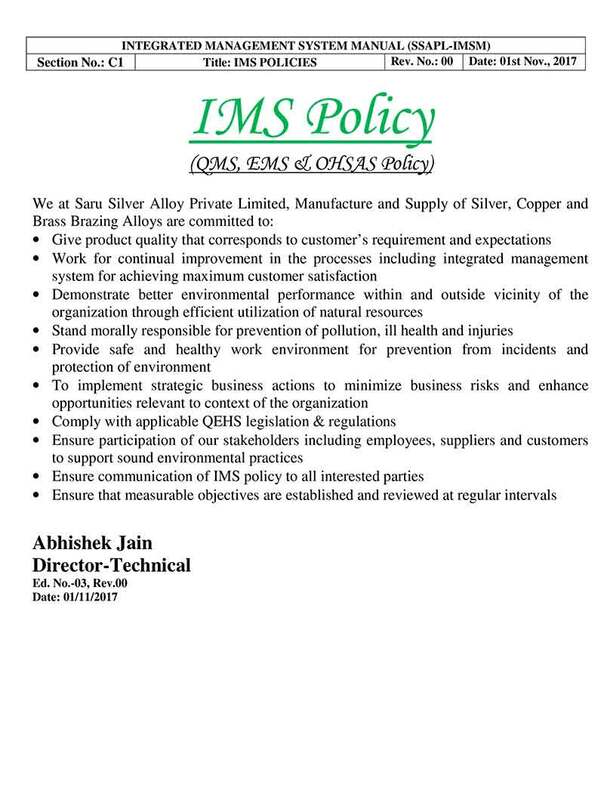 About Saru Silver Alloys Private Limited, Meerut, U.P. Saru is an Indian non ferrous manufacturing group with a long historic background and has successfully maintained an innovative spirit since its founding in 1944. 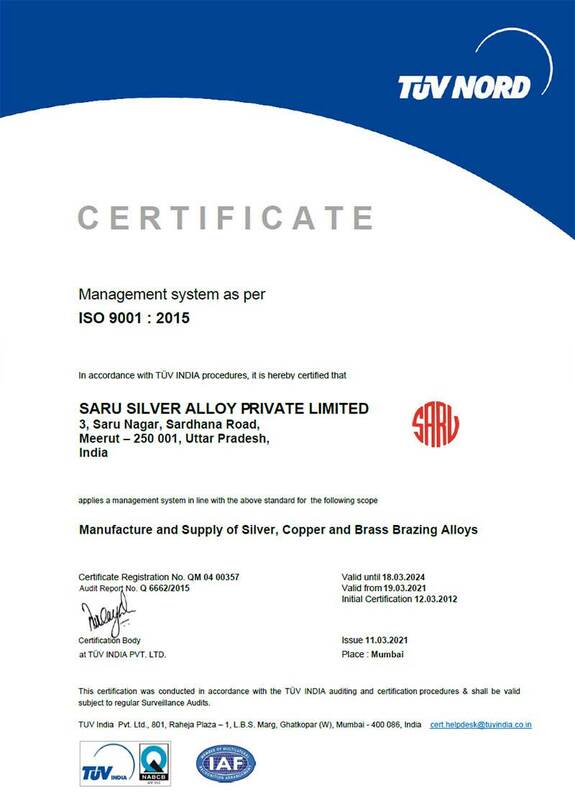 It's division Saru Silver is the largest and pioneer manufacturer of Silver Brazing Alloys in India exporting to more than 65 countries worldwide. 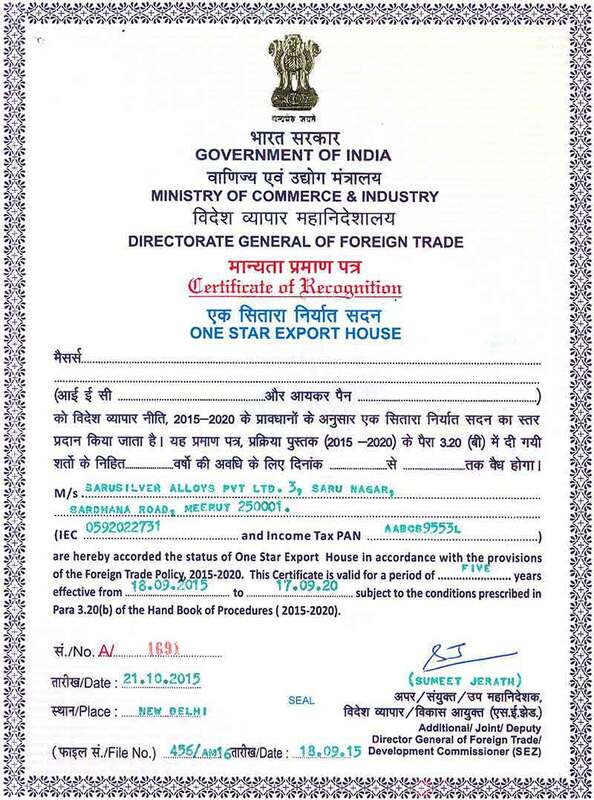 Started trading in Non Ferrous Alloys. 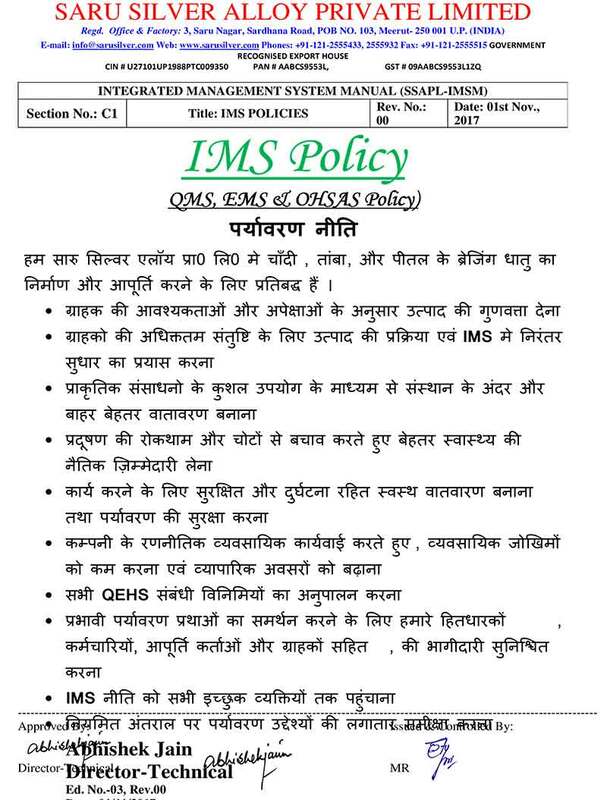 Took contracts for the supplies of Non Ferrous metals to military establishments. Saru Smelting Private Limited was formed with the manufacture of Flux Cored Solder Wire. Started the manufacturing of Silver Brazing Alloys. First Non Ferrous Continuous Casting Plant in India for the manufacture of Continuous Cast Phosphor Bronze. A group company, Saru Aikoh was formed in technical collaboration with Aikoh Co., Japan for manufacturing Foundry Fluxes. Saru Aikoh ventures into Continuous Cast Fluxes in technical collaboration with Nippon Thermochemical Company, Japan. A Tin Smelting Plant was set up with the technical know-how from Base Metal Synergy Associates, U.K. by the name Sartin Alloys, another group company. 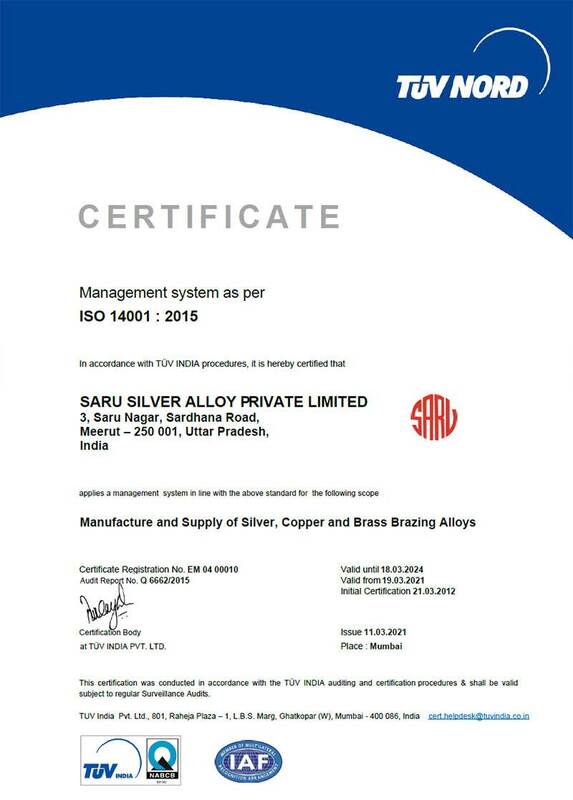 Due to the rapid growth in the Silver Brazing Division, it was demerged to be known as 'Saru Silver Alloy Private Limited'. 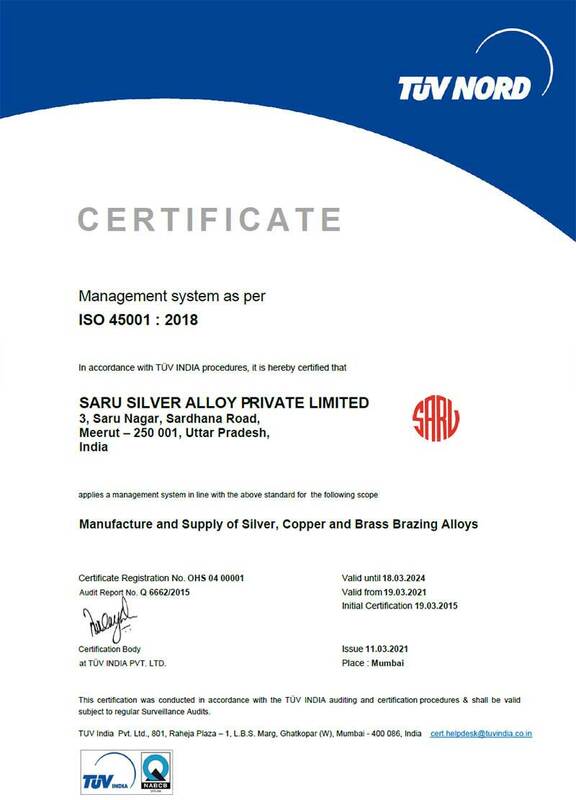 Saru Silver is a principal supplier to various industries like Automobiles, Railways, Electrical & Switchgear, Pumps & Motor Industry, Air Conditioning & Refrigeration, Cutting Tools, Machine Tools, Diamond Tools, Oil & Natural Gas, Defence, Aerospace, Atomic & Nuclear Energy. Saru Silver has the most updated technology along with modern machines in the Indian Industry. Our highly experienced and trained manpower along with adhered to quality systems only makes our job easier to produce world class brazing alloys & fluxes. Our tight in-process controls allow us to consistently manufacture products with zero defects. All our products finally go through our state of the art quality lab & quality assurance team who ensure that our customers receive only the finest. 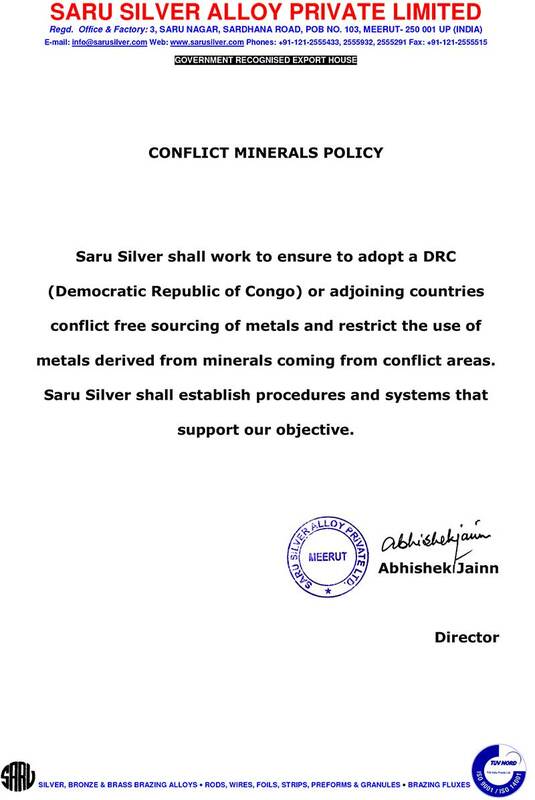 Saru Silver provide complete traceability of its finished product. Each lot of brazing alloy is certified to meet IS, AWS, DIN, BS, ISO and other popular specifications as ordered by the customer. As a specialist in the brazing industry and having the advantage of being the oldest & highly experienced, we offer the most comprehensive and widest range of brazing alloys, induction brazing, brazing and silver solder braze. Saru brand is recognized as a reliable and a dependable supplier offering quality products at one of the most competitive pricing available in the world.